Today is officially when Day After Christmas sales start. Here's what's on sale at Walmart, Macy's, Best Buy and more. The best After Christmas sales are here in case you woke up today and realized you didn't get exactly what you wanted for Christmas yesterday. There are plenty of US retailers willing to sell you gadgets at a cheaper price. Day After Christmas sales are designed to lure people making returns into keeping their money in store coffers and get rid of extra inventory. Our newly updated list of the best After Christmas sales involves Walmart, Amazon, Best Buy and B&H Photo. Today's deals are actually consistent with the price drops we saw one month ago. In some cases, we're seeing even cheaper prices. Amazon calls them Year-End deals, while others go with the name After Christmas sales. It's all semantics. The trick here is get what you really wanted, and do so at a better price than you would normally, say in January or February 2019. 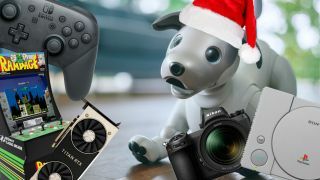 So, if you're looking for the best After Christmas sales today, check our constantly updated list of deals below, now updated for Wednesday. Here's a great piece of advice for everyone shopping online: look for open-box or refurbished items in excellent condition during After Christmas sales. People who don't exactly get what they want and never play with the tech often return it. US retailers have to label these items open box and the typically come with significant price drops. For example, that Apple HomePod deal for $250, down from $350, was actually price matched by an open-box discount that lasted a lot longer. In one case, we got it for $238, and it was listed in excellent condition. Metroid Prime 4 is still a ways off, but Axiom Verge is the closest thing to a classic Metroidvania game, and it’s a good one at that, don’t pass up the chance to buy it for $10 off. We'll continue to update our After Christmas sales list throughout the week, as we discover more discounts. This is just the start of what we expect US retailers to price drop. We'll also keep tabs on which deals expire, so you can hit checkout with reliable deals, as many after likely to sell out.